Three Minute Thesis is a research communication competition challenging Ph.D. students to present a compelling oration on their thesis and its significance in three minutes or less to a non-technical audience. 3MT is not an exercise in trivializing or “dumbing-down” research, but challenges students to consolidate their ideas and research discoveries so they can be presented concisely to a wider audience. Open to all doctoral candidates in good standing who have completed preliminary exams by the nomination deadline. Rules and judging criteria can be found at 3mt.wsu.edu/rules. Contact your faculty advisor or email chrisgass@wsu.edu. Winner moves on to the WSU Competition. 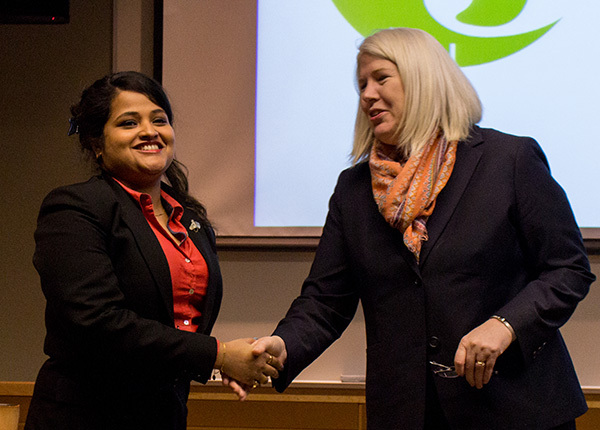 Dean Mary Rezac congratulates Dishary Banerjee on winning the Voiland College qualifying 3MT event.